Tudor ‘Daytona’ … For years the brand Tudor stood in the shadow of it’s ‘big brother’ Rolex, but the brand nonetheless managed to secure a loyal and attentive following. It’s the hidden qualities of the watches that are so convincing, the special Rolex features and knowledge that are practically free at Tudors hands! Okay, so the latter ones don’t come with the Rolex cases and crowns, but they do come without a surcharge! Rolex spend decades on building it’s brand image and research and development departments and Tudor profits from these achievements. 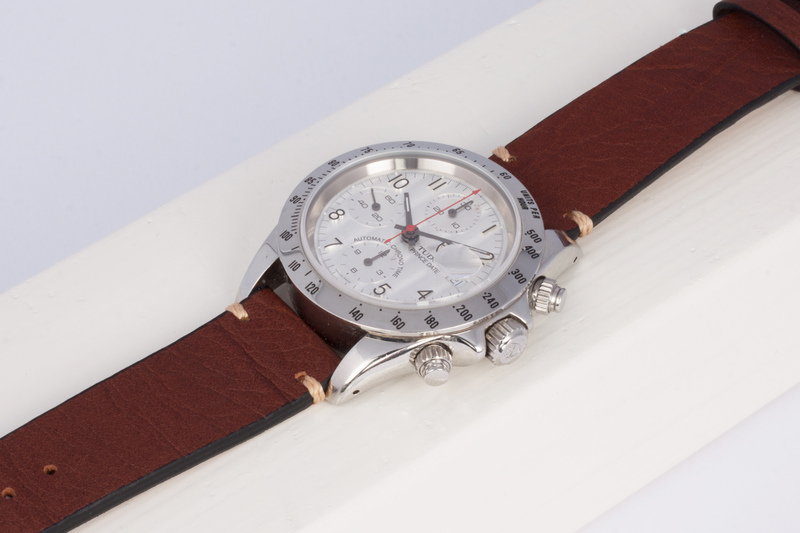 Take a look at this Tudor Prince Date Chronograph for instance, here’s a watch that profited from Rolex it’s knowledge and quality of production. The wonderful silvered dial with it’s Côtes de Genève finish is a treat for the eyes as the light moves across the dial, the applied Arabic numerals feature a black lacquer finish on top of the numbers while the red chronograph arrow hand makes the whole dial and watch pop! 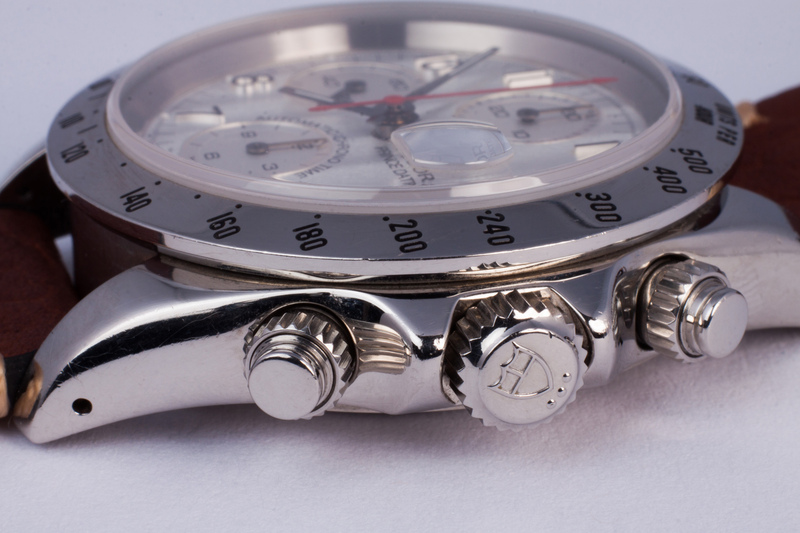 The case of this Tudor Chronograph is slightly thicker than the Rolex Daytona, it does feature the same screw down chronograph pushers and crown like the Daytona, making this watch not only very sporty, but also very waterproof. 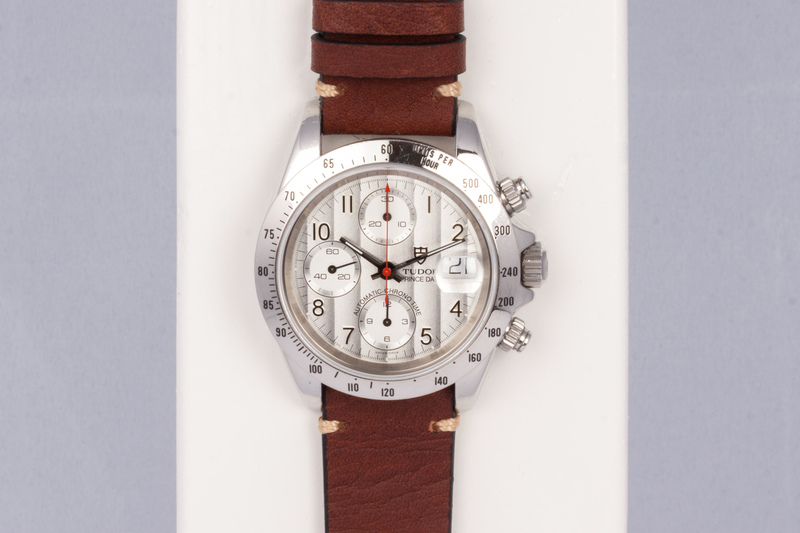 This Tudor also has another complication that is not featured on any modern Rolex chronograph, the date window! 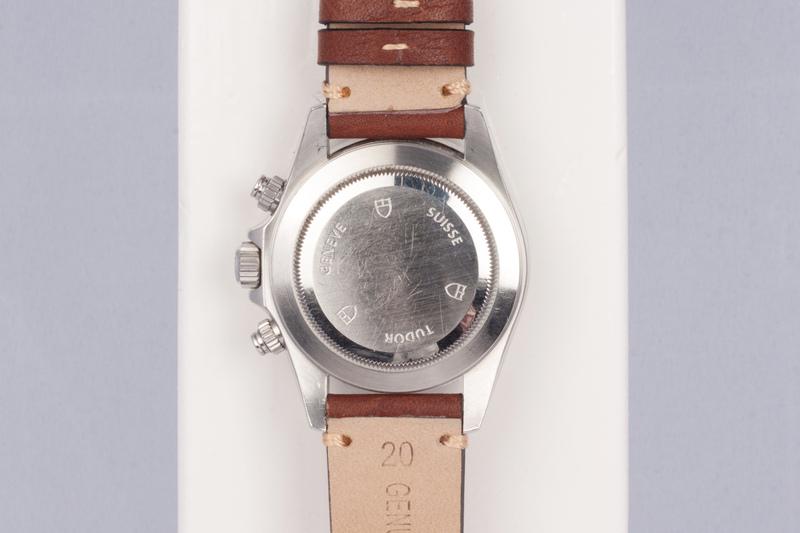 With it’s 2.5 magnification you will never lose track of the date again. So, in short; a very sporty, tough, cool and high quality watch, made by Rolex for a fraction of the Rolex price… What’s not to like!? 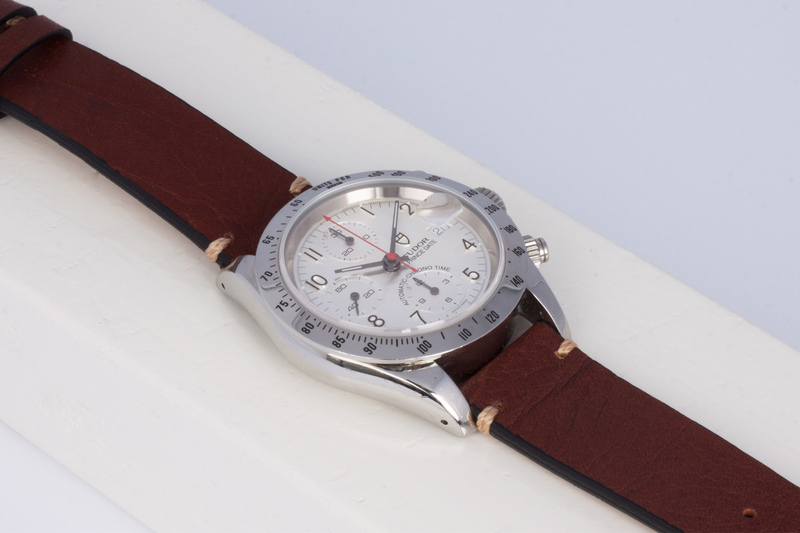 We fitted the Tudor on a Whiskey brown vintage strap just to add some warmth to all the silver and steel colors. 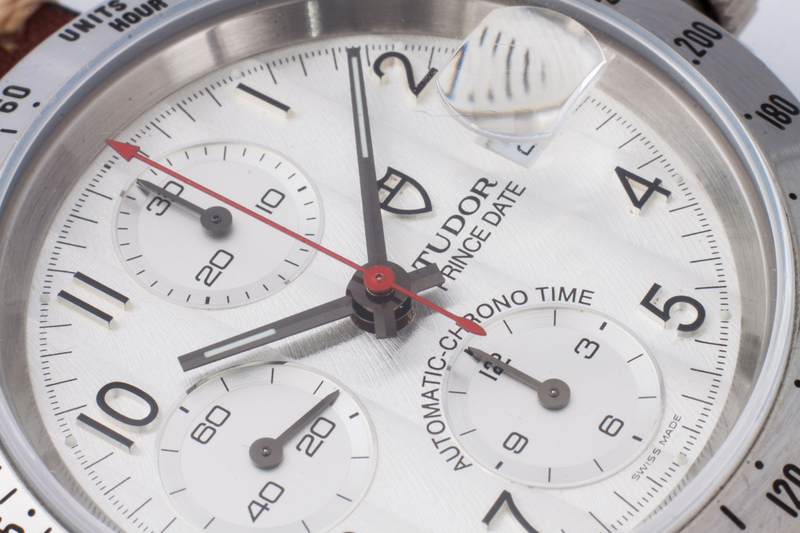 The Tudor Prince Date Chronograph has been serviced by our watchmakers and comes with a one year warranty.